Cabo San Lucas Christmas And New Years Eve/Day in Condo for Six! 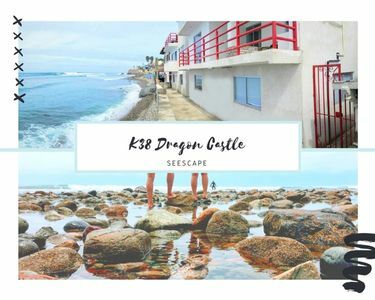 We are long-time owners of an ocean-front condo in Cabo San Lucas, BCS, Mexico that sleeps six, which we are renting out during Christmas and New Years week. 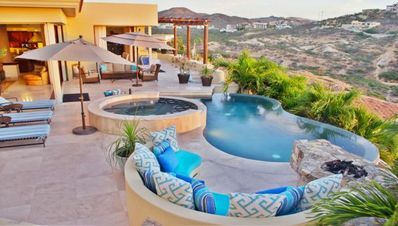 This is the most desirable time to visit Los Cabos, and many resorts are already sold out! 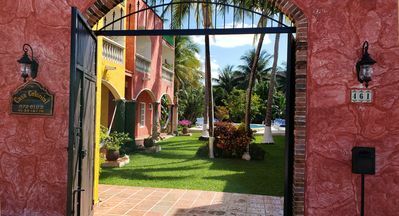 Our Palapa Beach Club condo is part of the Sandos Finisterra resort, but as original owners under the Hotel Finisterra, we are grandfathered in and waived from having to participate in their typical mandatory all-inclusive fees. The same is true for anyone using our unit. There are absolutely NO EXTRA FEES and NO TIMESHARE PRESENTATIONS required. This is not a voucher or any other way to hook someone into a sales pitch, as some other listings may be. This is our unit, not an exchange, so no worries about an RCI resort fee either! Upon check in, you will be asked to place a valid credit card on file for your incidental charges, if any. This would include food, drink and taxes on those items, unless you opt to participate in a per person per day all-inclusive food/drink upon your check in. It would also cover any guest damages, missing items, etc. as typical with any other resort policy. Upon payment, there will be a reservation assigned in your name for check-in on December 25, 2017 and check out on January 1, 2018. To reserve our condo, at least one person in the party must be 21 years of age or older. The condo sleeps up to 6 people, with two full/queen beds in the bedroom and one pull-out sofa sleeper in the living room. There are two full baths, which is fantastic for a family or group of friends wanting to get ready for a night out after a day in the sand and sun! The listing photos include a floor plan of the unit, which is currently assigned on the 4th floor. The actual unit number is subject to change at the condo manager's discretion, but it will be the same unit type and may be a mirror image of what is shown in the floor plan. 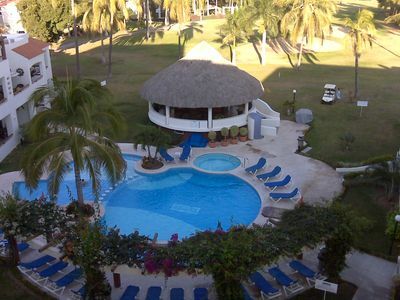 All units in the Palapa Beach Club are Ocean View and we have never once been disappointed! The floor plan shows two chairs in the living room area, and we have only had one upholstered chair and sofa in living rooms thus far. 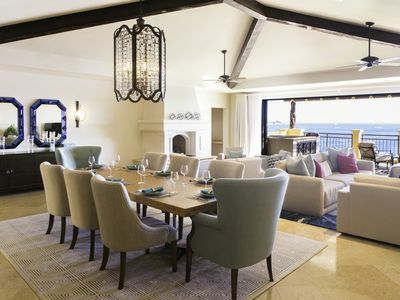 There are typically six chairs at the dining table (floor plan shows four), and typically two or three additional chairs for the granite breakfast bar. The patio furniture does vary per unit (sometimes, it is plastic seating for four, as shown; other times, it is nice padded wicker lounge seating off the main bedroom). Things that we love best about Cabo this time of year are the near-constant days of sunshine and temperatures in the low 80s with low humidity; the vibrant sunsets; watching whales from the balcony, pool and beach; the privacy of being on over 7 acres of pristine Solmar beach (no peddlers or non-resort guests allowed, unlike Medano beach or the tourist corridor); seeing Sammy Hagar and friends at the Cabo Wabo (frequent New Years celebrations in the past); and watching the NYE fireworks from the Finisterra's rooftop lounge overlooking the marina and Medano beach. The people are always friendly, and most of the staff at the Finisterra have been working there for at least the last 25 years since we first started our visits. Truly amazing! Although you are in a condo with a fully equipped kitchen (stove, full size refrigerator and freezer, microwave, cookware, dishes, flatware and glasses), you still have all the amenities of being at a resort hotel. 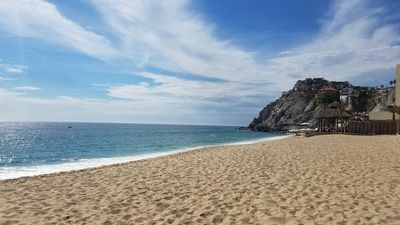 Consult with resort personnel upon arrival for current swimming conditions before using any beach on the Pacific side of Los Cabos. 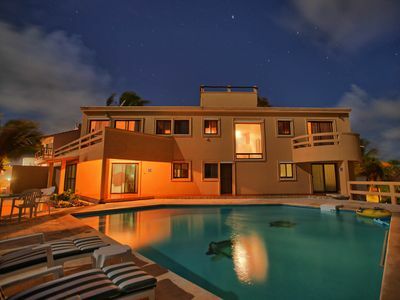 Akumal Oceanfront with 3 Bedroom suites, oceanside pool, palapa, AC, Wifi. 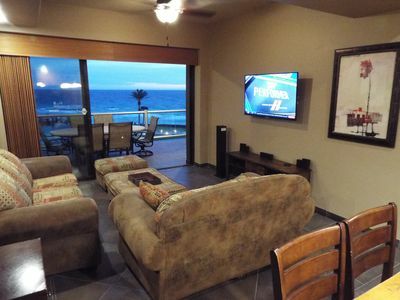 Playa penthouse @Hacienda with amazing ocean views! 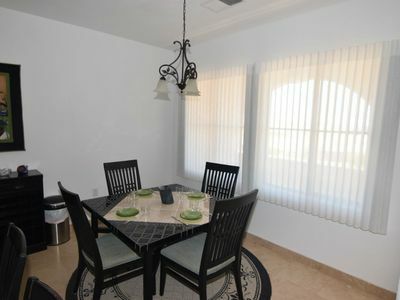 4BD Villa: Golf view w/pool & jacuzzi! Cook Incl! 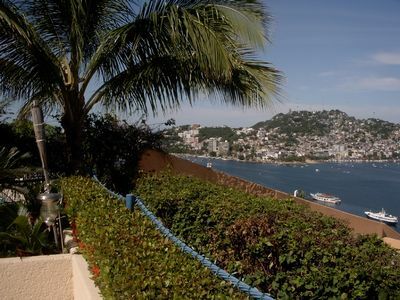 Magnificent Luxury OceanFRONT 3BD Condo in Preferred Cristal Building Location! 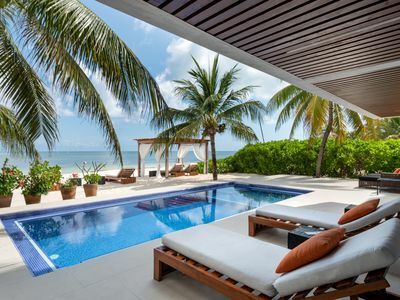 Far from ordinary...Luxurious Villa On White Sandy Beach with infinity pool!